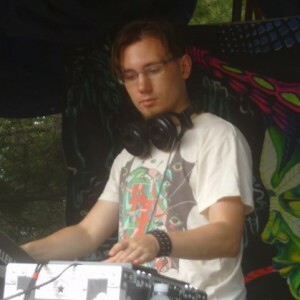 Basilisk is the founder of the Ektoplazm netlabel group and free music portal, one of the world’s top online destinations for psychedelic trance, techno, and downtempo. With more than a decade of experience behind the decks Basilisk is also an accomplished DJ. Much of his success can be attributed to his tireless work ethic and productive drive; aside from DJing, Basilisk also manages three record labels (the eponymous Ektoplazm as well as Drumlore and Omnitropic), co-founded Techgnosis Records alongside Ben Rama, compiles various artist releases (notably , Ektoplazm’s Greatest Trips, Spectral Circuitry, Dreamshadow, Organic Circuitry), develops and maintains the Ektoplazm web site, designs album artwork for numerous releases, and champions the cause of Creative Commons licenses and new music distribution strategies for the 21st century. DJ Basilisk spins an eclectic variety of styles covering all points of the psychedelic trance and techno spectrum. Every performance is entirely improvised and custom-crafted to fit with the theme of the event and the flow of the night. With a history stretching back more than a decade, Basilisk is proficient in both vinyl and CD mixing, but now prefers using a laptop and MIDI controller to maximize the creative potential of his sets with harmonic mixing and an expert use of effects. A true believer in the classic techno-shamanistic concept of “the set as a journey”, Basilisk prefers to mix up the many styles of psytrance rather than stick to one formula. Depending on the time slot and nature of the event Basilisk is also known for breaking into blistering hard darkpsy, forest music, the more sophisticated side of full-on, the cold and mechanical sound of techtrance, and the pumping energy of progressive. Old school mid-nineties Goa trance and classic psytrance sets are also available on request. Basilisk is also dedicated to progressive techno, the emerging fusion of minimal techno, progressive house, and psytrance, a deep and dirty blend of cutting edge electronic music elements and archetypes that will thrill any audience. Visit Drumlore or check out his Synaptic FX side project to find out more. Contact info: use this form to send me an email! You can also find Basilisk on Facebook and Mixcloud. A 5-hour, 69-track midtempo and downtempo odyssey mixed by Ektoplazm's founder, DJ Basilisk. MP3 Download | FLAC Download | WAV Download · Download count: 47,178. Highlights from the Ektoplazm free music portal, 2008–2012, selected by Basilisk. MP3 Download | FLAC Download | WAV Download · Download count: 59,239. A celebration of the vibrant diversity of the global psychedelic trance underground. MP3 Download | FLAC Download | WAV Download · Download count: 36,046. A mesmerizing exploration of the darker side of psychedelic trance compiled by DJ Basilisk. MP3 Download | FLAC Download | WAV Download · Download count: 31,857. A diverse and colourful assortment of melodic psychedelic trance compiled by DJ Basilisk. MP3 Download | FLAC Download | WAV Download · Download count: 39,709. A sizzling blend of neotrance, melodic techno, and progressive psytrance. MP3 Download | FLAC Download · Download count: 13,392. A dark journey through classic psychedelic trance. MP3 Download | FLAC Download · Download count: 27,500. A tasty blend of darkpsy, full-on, and Goa trance recorded live in America and featuring 100% Creative Commons-licensed music from Ektoplazm! MP3 Download | FLAC Download · Download count: 22,510. Travel through time to experience the classic sound of Goa trance circa 1996! MP3 Download | FLAC Download · Download count: 19,245. A deep journey into mid-tempo Goa trance, dub techno, and progressive house classics. MP3 Download | FLAC Download · Download count: 20,606. Sunday morning classic Goa trance set recorded live at Om Reunion Project's Re:Generate festival in 2011. MP3 Download | FLAC Download · Download count: 21,667. A special classic psytrance mix featuring music from 1997 to 1999 with an emphasis on the darker side of Goa trance. MP3 Download | FLAC Download · Download count: 24,880. A deep and driving blend of melodic techno and progressive psytrance. MP3 Download · Download count: 18,982. A challenging blend of hard and nasty darkpsy with a splash of melodic full-on near the end. MP3 Download · Download count: 18,768. A frosty blend of minimal techno, progressive house, and deep psychedelic trance. MP3 Download · Download count: 18,236. Full-on psychedelic trance; a two-hour live recording from site owner DJ Basilisk! MP3 Download · Download count: 28,239. Recorded live at Harvest Festival 2006; a tight blend of progressive house, electro, and trance. MP3 Download · Download count: 15,837. Light and funky progressive psytrance with an upbeat and melodic feel, perfect for lazy afternoons. MP3 Download · Download count: 15,887. A tight mix of progressive and full-on psytrance filled with summer spirit. MP3 Download · Download count: 17,766. Dark and melodic full-on psychedelic trance with a slightly Gothic atmosphere. MP3 Download · Download count: 19,862. This mix is a tribute to the mood and style of Blade Runner. Techtrance with some progressive. MP3 Download · Download count: 14,704. A journey into the subconscious state of dreams; progressive psytrance with tribal overtones. MP3 Download · Download count: 14,810. Awesome-sauce! Totaly dig it! I will keep this in regular roation! Noma and Etnoscape rules… Do you know some similar producers? Your mixes are flawless by the way… Very clear and supplemental. Yes! This album scored a cover. Nice. It totally deserved it. Session much quality in their selection and mixing music. Wearing a development from start to finish and get envolverte in an atmosphere of peace of mind and tranquility. Ultimately few sessions can be heard on the network with this quality. just few littles words….from France….to say…..your music in my heart !! your djmixs turns very often in my appartment,in my car….. and it’s ever a pleasure to hear them!! i like your mixes very much… almost all of them are realy great pieces and almost all are of my test. i used to l them from alternate saurces not from this site so now i see that you also have very creative covers for those mixes! respect friend! No FLAC or WAV :(? Good everning, Why is there no WAV-download given? In our family, we are very pricise and hear every quality is lost by compressing to another format that WAV-1411. Should be very nice if WAV is given… Thanka!!!! PS. The ¨Colors of Ektoplazm¨ 5 hours mix is very good!!!!!! That was in WAV-1411. Not possible to burn the DVD with individual tracks using the CUE-file. DVD was seen bij Brasero but burning… Uh uh… Hoping you tell me how to do that job. Thanks!